A miniaturised scanner that can peer into the brains of freely-roaming rats has been demonstrated by researchers. Their wearable "Ratcap" does positron emission tomography - an established technique that tracks the movement and change of an injected molecule. Typically these scans must be done on anaesthetised rats in a fixed scanner. The device, Nature Methods, will allow researchers to study them in detail as they move, acquiring both chemical and behavioural information. 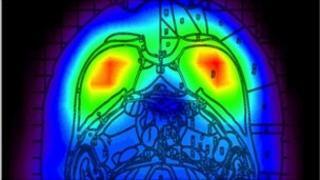 Positron emission tomography, or PET, measures the brief flashes of high-energy light that result from the radioactive decay of a "tracer" molecule. That requires a great many crystals and detectors, arranged in a ring, to catch the rays and determine the location from which they came. As a whole-brain imaging technique that examines how chemical signals move between neurons, it is a powerful technique to study the fundamentals of brain activity. "The rat is a very important model in medical research," said Paul Vaska, head of PET physics at Brookhaven National Laboratory, US. "PET is used with rats quite a bit these days. However, the rat has to be anaesthetised to do the scan and the anaesthesia disrupts the normal brain function, so when you're looking at brain studies this is a big problem." Now, Dr Vaska and his colleagues have fit nearly 400 of these crystals and associated electronics into the Ratcap - short for Rat Conscious Animal PET. Weighing in at 250 grams, it is still too heavy to be worn simply, so the team arranged a system of springs and pivots that allowed a rat to move around unhindered while wearing it. To demonstrate the device's capabilities, they measured the uptake of dopamine, a "neurotransmitter" whose associations with excitability and reward are already well-established, based on studies of anaesthetised rats. However, the team found that dopamine levels were lower than expected in initial tests, based on prior studies, and surprisingly that dopamine is found in the cerebellum, a region of the rats' brains that does not even have receptors for the molecule. That the Ratcap is already yielding insights and contrasts with established studies is an indication of the neurology secrets it may tap into. "This can give us not only better information about the brain, because the anaesthesia is no longer there which can potentially corrupt the data we're getting, but also allows us to measure the behaviour of the animal at the same time that we're getting the brain data," Dr Vaska said. "There's a lot of excitement about being able to correlate these two data sets and learn potentially much more about the brain."